Leipzig, Germany, July 23, 2018 — Rohde & Schwarz, the leading vendor of deep packet inspection software, today announced that they are now supplying Indigo Software with their DPI engine R&S® PACE 2 to enhance Indigo Software’s web application security solution with their protocol and application classification capabilities. 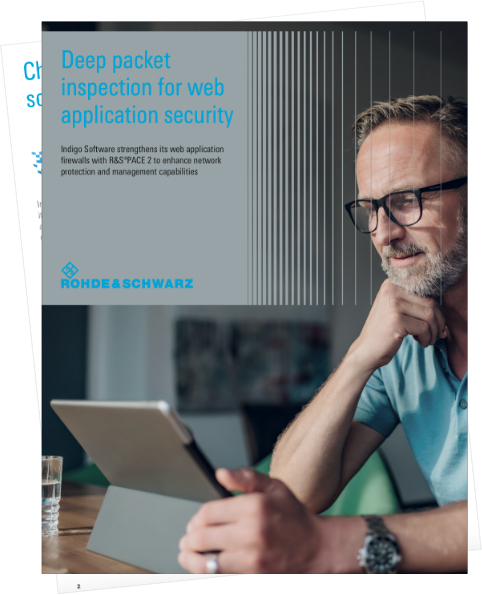 R&S®PACE 2 now serves as the core for their web application firewalls (WAFs), enabling them to obtain granular visibility of network traffic in order to analyze HTTP requests and responses to detect malicious behavior. Web application firewalls as provided by Indigo Software have become an indispensable component in the application delivery infrastructure as they offer Layer 7 web application security to prevent attacks such as SQL injection, cross-site scripting (XSS) and DDoS attacks. WAFs are able to detect and block malicious activities behind inconspicuous website traffic that may slip through traditional security solutions. Indigo Software was looking for a DPI solution to meet their increasing need for fast performance, high application and protocol classification accuracy as well as a DPI engine with a very low memory footprint. With R&S®PACE 2, they found an easy-to-integrate software library that operates in real time at a speed of multiple Gbps. R&S®PACE 2 receives weekly protocol and application signature updates which ensure that Indigo Software firewalls make accurate decisions on reliably classified traffic. Since Indigo Software integrated the DPI engine R&S®PACE 2 into their WAF, customer satisfaction has greatly increased because they instantly saw significant improvements in application performance and availability, as well as a reduction in lag time. Before Indigo Software deployed the new solution, an unacceptable number of false positives in previous vendors’ products had made it difficult for their customers to manage and control applications within their networks. With its superior throughput and real-time deep packet inspection capability, the DPI engine’s network performance guarantees a good customer experience. “We had evaluated open source alternatives as the core for our web application firewall, however they did not offer the performance and reliability required by our customers. The Rohde & Schwarz DPI engine gave us what we needed—from carrier-class performance and reliability to the detection of applications, protocols and even encrypted applications to excellent developer documentation and sample code,” says Adam Murad, CTO at Indigo Software.